Neighbourhoods are the foundation for a first-class town — the foundation of a first-class neighbourhood is its infrastructure. 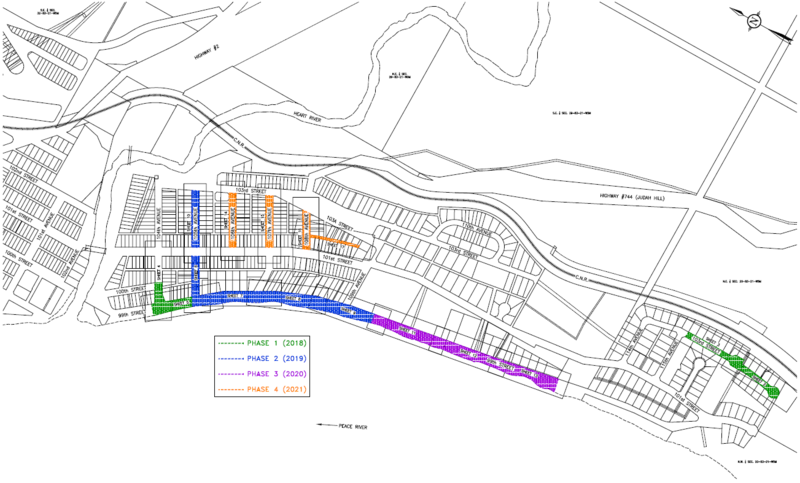 Beginning in the spring of 2018, Peace River’s south end will undergo a major infrastructure renovation as part of the Town of Peace River’s Neighbourhood Infrastructure Renewal Program. Through a phased approach, over four years, existing water, sanitary and storm sewer, roads and sidewalks in a large area of the south end will be replaced or rehabilitated. This project is part of our goal to ensure the long-term sustainability, of our roads, sewers, pipes and other infrastructure. To do this Town administration looked at the lifecycle of the overall infrastructure across the town to determine the order in which neighbourhoods are renewed. While the construction portion of the project will cause a temporary inconvenience to residents who live in the areas slated for renewal, it will be worth it. During this project communication between the Town of Peace River and the residents will be important. Although email is going to be the primary media used to communicate, we will endeavour to keep affected residents informed of impacts to their streets through multiple media. If you live in the area and have not signed up to receive email updates, please do so via the form below, if you have questions, feel free to send us those. For those without access to email please call us at (780) 624-2574 to make alternate arrangements.